In L'imparfait, almost all verbs conjugate in the same way, but verbs ending in -ger require a slight spelling change - an extra 'e' after the soft 'g' - to keep the pronunciation [j]. 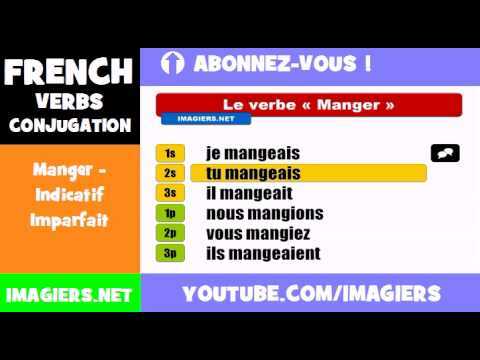 Notice that in the nous and vous forms, the -e of mange has been removed because the -i is enough to keep the g soft. I used to eat pasta. Were you tidying your room? She used to travel a lot. Nous changions de voiture tous les ans. We changed cars every year. Vous voyagiez tout le temps. You used to travel all the time. Ils mangeaient leurs crottes de nez. Spelling mistakes + unanswered questions. Unfortunately I make lots of mistakes in spelling and often do not answer a question. These can be caused by my clumsiness when using touch screen tablets. It does not necessarily mean that I didn't know the answers. Would it be possible for Kwiziq to introduce a filter which allows the learner to override these "mistakes". I make spelling mistakes using touch screen tablets I would never make when writing long hand. It seems that my keyboard skills are being tested not just my French. "Nous changions de voiture tous les ans". Why can't we say "Nous changions une/notre voiture tous les ans"? When do we use "changer de" and when do we use "changer"? What is their difference? Changer de and changer have a very similar meaning albeit not exactly the same. Nous changions de voiture tous les ans. -- We used to have a change of cars every year. Nous changions la voiture tous les ans. -- We used to change the car every year. That's my understanding of the matter, but the opinion of a native speaker would be appreciated. When you use the verb 'changer' the subject is doing the "changing". Il a beaucoup changé, on ne le reconnait plus. With 'changer de' it is the object doing the "changing". this is an interesting explanation that I am still not entirely clear about. Would the sentence "Je change ma robe." be incorrect? And if not, how would it be translated? Yes, you can say 'Je change ma /de robe car j'ai fait une tâche dessus'. or even 'Je change ma/de voiture cette année. Changer ( intransitive verb) means just 'to change'. Il change en ce moment, il devient vraiment méchant. A big difference in meaning between "Je veux changer le pays" (I want to change the country) and "Je veux changer de pays" (I want to leave the country)! My 2 bits: I want 'a change of' country (changer de). I want 'to change' (changer,trans) the country. The country is changing (changer ,intrans). Sorry, my full question didn't post. Used to or was doing something... Is imparfait more of "I used to do something" or storytelling "I was doing something" ? The examples on this lesson use "I used to..." but on another imparfait lesson they use "was doing." Je mangeais des pâtes. I used to eat pasta. Could the translation also be "I was eating pasta" ? An example on another lesson for l'imparfait is: Je faisais un château de sable. I was making a sandcastle. Based on the examples on this page- the translation for could also be "I used to make sandcastle(s)" Help! yes, the Imparfait can express habits in the past or describe the setting of an event which happened in the past. Le dimanche je visitais le musée. -- Sundays I used to visit the museum. Je visitais le musée quand j'ai rencontré Marie. -- I was visiting the museum when I met Marie. In French, you have mainly 2 past tenses : L' Imparfait and Le Passé Composé. We don't have a Continuous past, equivalent to "was doing", so we will use L'Imparfait instead. It's also L'Imparfait that we use when talking about repeated actions in the past, hence being equivalent to "used to" in certain cases. Ron, thanks for your answer. I'll need to work that one through a bit. Is it because it's a negative vs affirmative statement issue, or that it's another of the words that has two meanings depending on where it is placed? Bonjour Terri ! Usually, when you have a conjugated verb followed by an infinitive, as is the case here (dois + pratiquer), the adverb will come in between the two verbs :) Bonne journée ! Aurèlie, Merci pour l'explication parce que je n'ai pas entendu cela expliqué comme ça. why does one use -ions and the other -eons, they're both -ger verbs.